Here is a totally random but very cool cucumber trick that will get rid of the bitter taste that many freshly cut cucumbers have. 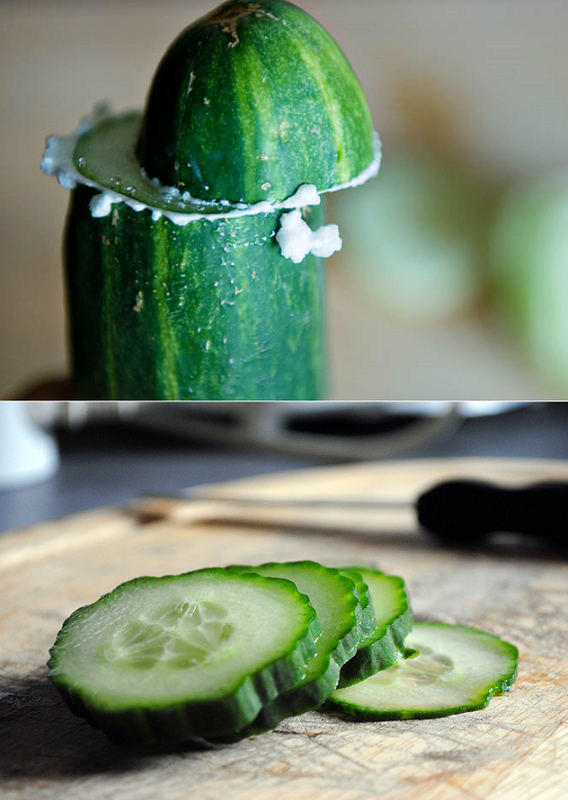 Before slicing it, cut off the end and rub this cut piece in a circular motion onto the end of the cucumber till it releases a white foamy substance. Repeat this on the other end too and then peel it or prepare it how you normally would. P.S: Plus this tip to make your home smell amazing and those 4 apple tricks. P.P.S: And here is also one for ginger. Amazing! I'm going to try it this weekend! So weird! I've never noticed bitterness but I will pay attention now and try this trick! Wait, what?! Awesome! I will definitely try this with our next one! Sounds interesting! But I haven't ever noticed a bitter taste in a cucumber.